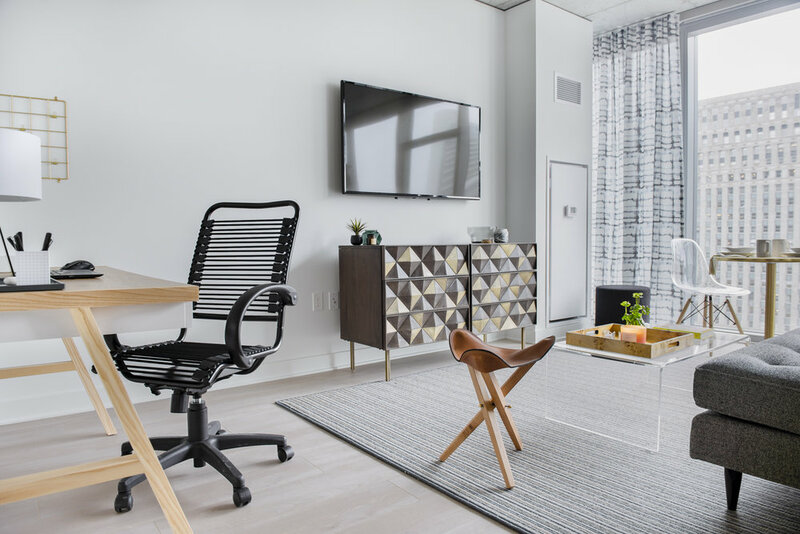 In 2017, we had the privilege of working with renowned developer, The John Buck Company, to design two model units for their new luxury rental building 3Eleven located in Chicago's River North. It was a fun challenge and opportunity to design spaces that were intended to inspire a wide array of people to sign a lease and move on in! 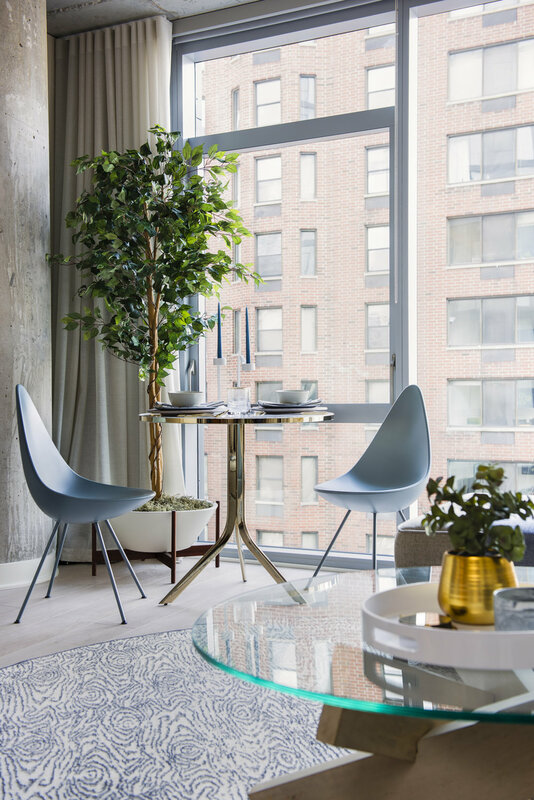 When designing the One-Bedroom model unit, we aimed to create a space that would appeal to young professionals craving a calm and sophisticated retreat to return home to at the end of a busy day. Using a neutral backdrop and layering in natural textures, interesting shapes, and subtle pops of color and greenery, we were able to create this vibe. 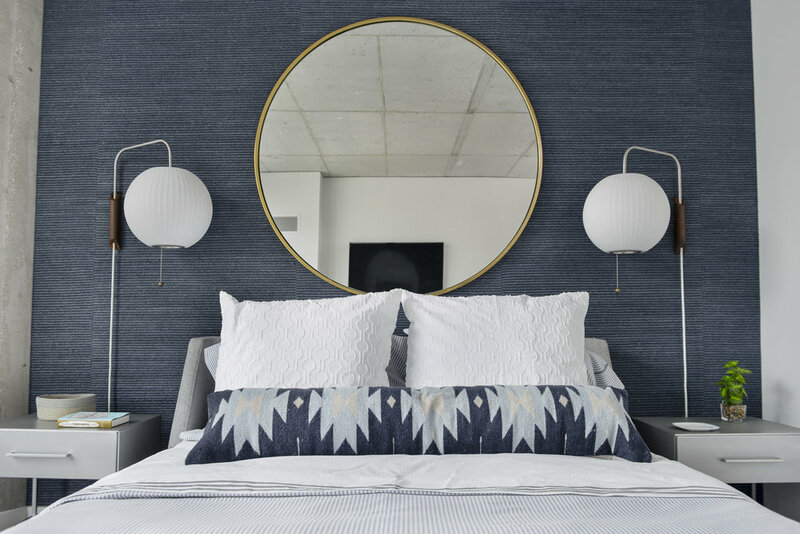 Special details like a striped grasscloth wallcovering in the Master Bedroom, custom area rugs, and soft drapery panels illustrate the potential these units have. 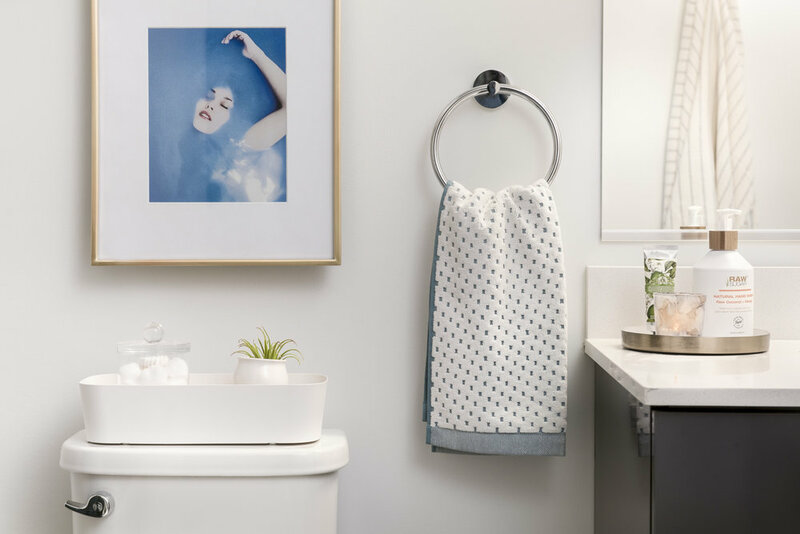 When we approached the design strategy for the Convertible Unit, we decided that this resident would likely be a bit more playful and open to unique pieces, and a creative layout. The Convertible Unit features a larger, single open space that allows the resident to merge their living and sleeping quarters into one. Our goal was to prove to potential residents that the Convertible Unit was not one to be overloooked. In order to further designate the sleeping area, we used a chunky blue braided wallcovering on the headboard wall to give a punch of texture and color to the space. Wall-mounted plug-in sconces allow the resident more lighting levels and comfort. To create the Living Area, we placed an armless settee at the foot of the bed, opposite the TV mounted above a full-size chest of drawers. 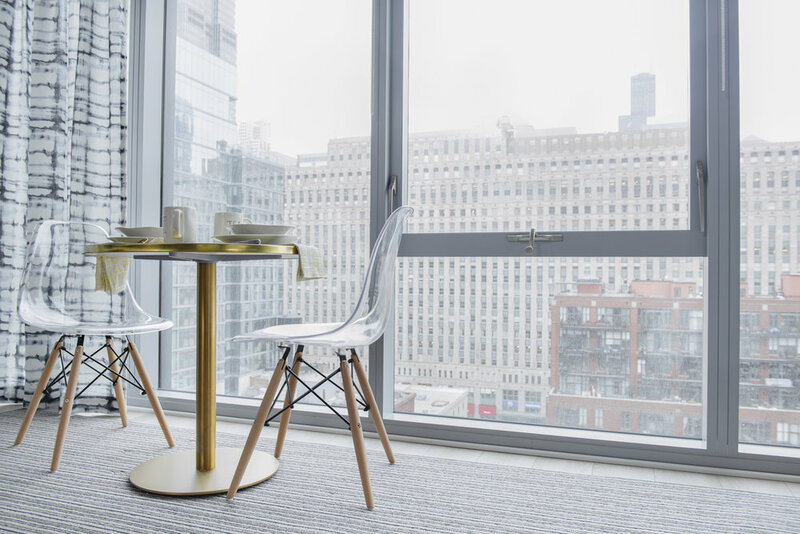 Because John Buck designed the Convertible Unit to be generously-sized, we were able to easily include a full work space, and a cozy eat-in dining setup near the windows with unobstructed views of Chicago's River North skyline. The galley style Kitchen was also wide enough for us to include an additional stainless steel prep table with low-profile counter stools. As a developer, we are always looking for ways to differentiate our product while maintaining an appeal that resonates with the market. Laura hit this one out of the park. Not only is she an extremely talented designer, but she and her Team were an absolute joy to work with. She is such a professional and continually listened to and addressed any of our needs which ultimately made my job so much easier. I look forward to our continued relationship with Outline Interiors.